R305 Camargo - Culpina, dpt.Chuquisaca, Bolivia. 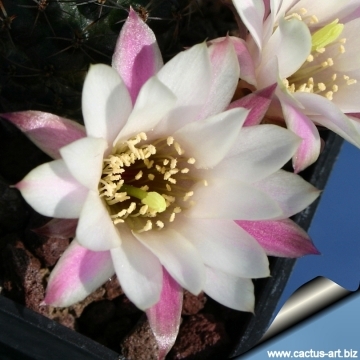 This is one of the few white flowered Rebutias, The white blooms contrast with the dark painting of the body, making it one of the most attractive species. Mediolobivia leucanthema var. cocciniflora hort. Description: Usually solitary in habitat (but in culture it can unwillingly cluster). Stem: Globose to short cylindrical, dark green to violet, up to 7 cm tall and 3,5 in diameter. It would appear that in cultivation these plants grow larger and cluster more vigorously than in habitat. Ribs: 13-14 spiraling, with distinct tubercles. Central spines: One or none, black to 7 mm long, predominantly directed upward. 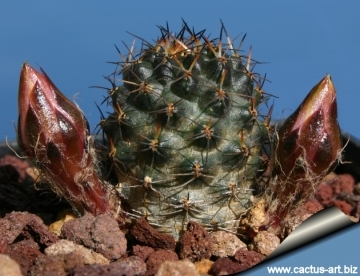 Radial spines:* 7-8, brown, darker at the base, slightly bent downward and covering the stem surface, up to 6 mm long. Flower: 2,5-3 cm in length and in diameter, from the base of the stems. White (although there are rarely seen plants with pink blooms). Internal lobes white or pink with the a white base, external pinkish with the a brown strip in the middle. The pistil is green. Blooming Season: IFlowers profusely in early spring. Fruit: Berrylike, hidden among the spines, 4-5 mm in diameter, globose, dark violet when ripe. 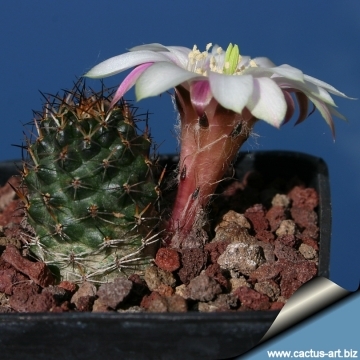 Cultivation and Propagation: This species is relatively hard to grow. Grow it in a very open mineral mix, (lots of pumice). It requires full sun or light shade and careful watering to keep plant compact . Keep dry in winter. Hardy to -4°C for a short period. 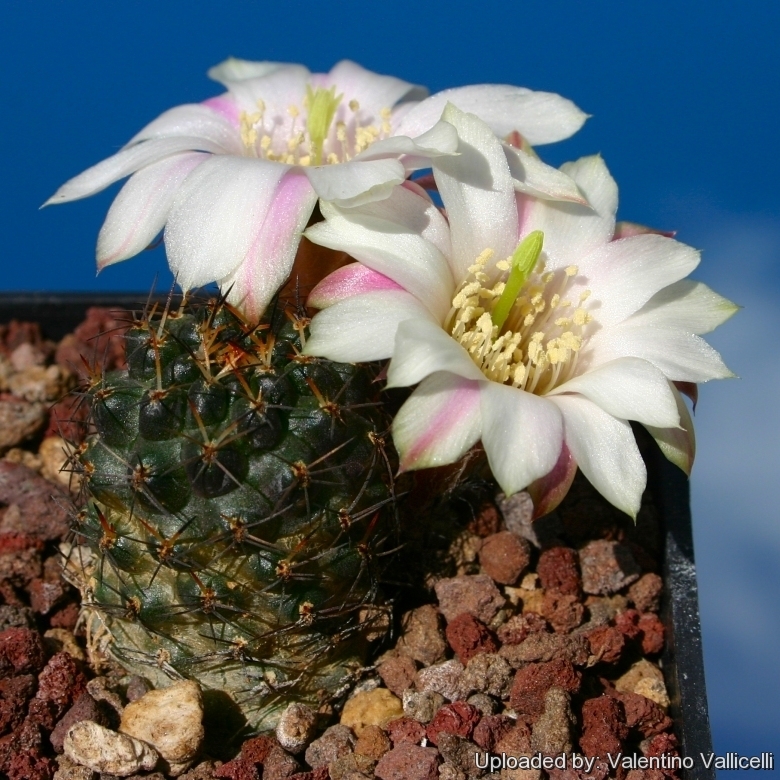 Rebutias grow in nature at high altitudes and do not thrive well at high temperatures in cultivation. They will often go dormant in mid-summer and resume growth again when the weather cools in late August. They can tolerate amazingly low temperatures for long periods of time. All species can take a frost even when not bone dry. It is generally accepted that plants kept at too high a temperature or watered too much during the winter rest period will not bloom the following year. Give them airy spot and ensure good drainage. It is better that they be repotted regularly. Pots should be only slightly larger than the plant and root system. The roots can break during repotting, and it is best to leave the compost dry for a while after repotting to avoid rot. Repotting will increase the number and size of stems, and will increase the number of flowers produced. 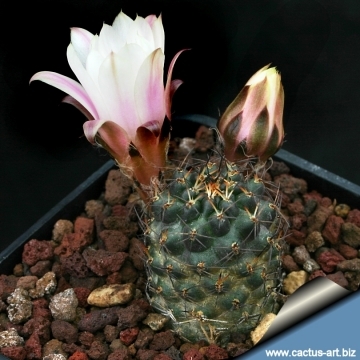 Repot yearly until reaching about 3 cm in size, then every two or three years will suffice. Repotting is best done at the end of winter, but can be done at other times, too. All plants, especially the young ones, are susceptible to red spider mites.